The 1st Anti-Aircraft Battalion, Coast Artillery Corps was formed out of several Coast Artillery Companies from the Coast Defenses of San Francisco, California in November of 1917. It was not until this unit went to France that it was know as the 1st Anti-Aircraft Battalion, with the Batteries then known as Battery A, B, C, and D. This unit went through three name changes and by the end of the war was known as the 1st Anti-Aircraft Sector, with the Batteries known as 21st, 22nd, 23rd, 24th, and 25th Batteries. 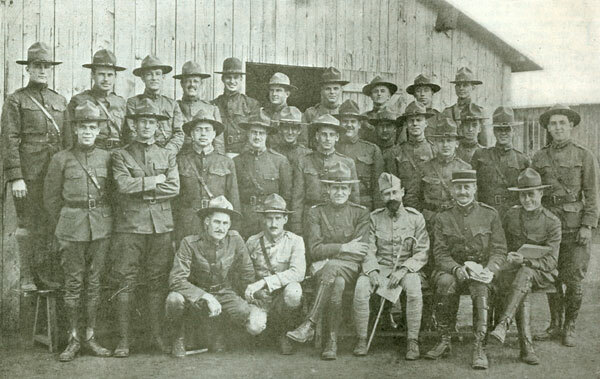 During November of 1917 plans were put in place to draw men from the Coast Defenses of San Francisco and to form an Anti-Aircraft Battalion at Ft. Winfield Scott, California. At first formation this unit was then known as the Anti-Aircraft Battalion, San Francisco, and was under the command of Lt. Colonel H. F. Spurgin, CAC. Headquarters and Supply Company was formed from the 5th Co., San Francisco that was organized in August of 1917 at Ft. Winfield Scott. Battery B was formed from the 10th Co., San Francisco stationed at Ft. Miley, California, which was organized in August of 1917. Battery C was formed from the 11th Co., San Francisco stationed at Ft. Baker, California which was organized in August of 1917. Battery D came from the 14th Co., San Francisco at Ft. Barry, California also organized in August of 1917. It is not known where the personnel were drawn from to form Battery A. During December of 1917 the Anti-Aircraft Battalion, San Francisco, was moved to Camp Merritt, New Jersey to await sailing orders. On 12 December 1917 the Battalion left Camp Merritt and went aboard the transport Susquehenna at the Port of Embarkation, Hoboken, New Jersey with 19 officers and 611 enlisted men. There were 4 troopships sailing that day and they may have sailed together and met up with additional ships in Halifax, Nova Scotia. The 4 ships were the Adratic, Pocahontas, Susquehenna and the Antigone. Battery B served with the 1st Army from 30 August-16 September 1918 on the St. Mihiel Operations. Headquarters Co. (3-inch auto-cannon) served with the 1st Army on the Meuse-Argonne Offensive from 26 September- 11 November 1918. Battery C served with the Second Army from 12 October-11 November 1918 and also during Post-Armistice activities 12 November 1918 until 15 April 1919. The entire 1st Anti-Aircraft Battalion was also on the Front West of Chateau-Thierry with the I Army Corps with 75mm guns from 4 July-17 July 1918. And again with the I Corps during the Aisne-Marne Operations 18 July-6 August 1918. They remained with the I Corps on the Vesle Front from 7 August-13 August 1918. On January 24, 1918, Batteries B, C and D of the 1st Anti-aircraft Battalion, left the Army Anti-aircraft School at Langres, France for Arnouville-les-Gonesse, France where they occupied Fort de Stains. 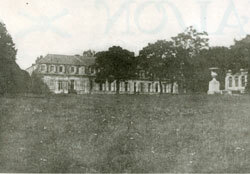 The Headquarters and Supply Company and Battery A, 1st AA Bn., remained at the Army Anti-aircraft School at Langres to drill with two auto-cannon which had been loaned by the French Army. 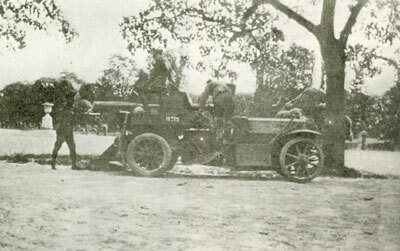 Battery B, 1st Anti-aircraft Battalion (now known as the 23d Antiaircraft Battery), which had two auto-cannons purchased from the French, with complete battery equipment had their first assignment with this equipment in the Chateau-Thierry sector, under French direction. Personnel of two antiaircraft battalions (10 batteries) and 3 separate batteries were on the American army front during the St-Mihiel and subsequent operations. The anti-aircraft artillery defense of the American armies was composed of French batteries, supplemented by the available American personnel and by the 23d Antiaircraft Battery (Battery B, 1st AA Bn). The photo above is of Gun No. 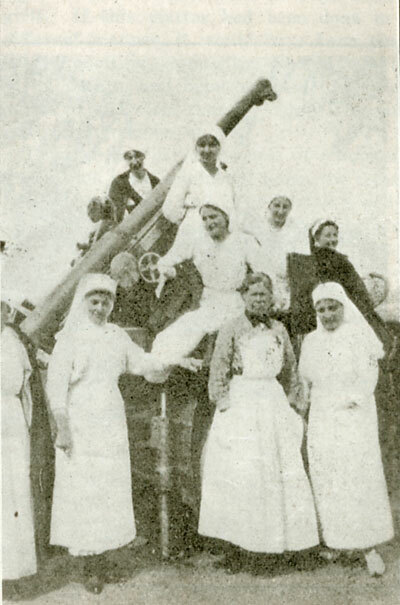 2, Battery D, 1st AA Bn., defending a French hospital with some French nurses posing in front of the gun. At the time of the German advance in March of 1918, the first American anti-aircraft batteries were still completing their training at Fort de Stains. In the emergency that then existed, these troops were offered to the commanding officer of the Paris defenses. Battery D, 1st Anti-aircraft Battalion, was assigned to station at Pontoise, March 30, 1918, to assist in protecting the railroad bridge at this point. This place had become very important due to the threatened cutting of the lines of communication at Amiens. Battery D, 1st AA Bn remained at Pontoise until the end of June, when they were assigned to a battery of 105mm. guns, at St-Mesves, also a part of the Paris defenses. Battery D then proceeded to the First Army front October 6, 1918, to join the rest of its battalion. The 1st Anti-aircraft Battalion went through several name changes while serving in France, and returned to the States as the 1st Anti-Aircraft Sector. On February 20 there were 13-officers and 382 enlisted men of the First AA Sector who boarded the battleship USS Ohio from Brest, France, and arrived 5 March 1919 in Newport News, VA going to Camp Stuart, Virginia for a short time before moving across the country to the Presidio in San Francisco, California. There during March of 1919 the First AA Sector was demobilized. A 75mm French Anti-Aircraft Gun manned by the 3rd Anti-Aircraft Sector. The Field and Staff of the 1st AA Sector was made up of 3 officers, Lt. Colonel Spurgin and a First and Second Lieutentant. The Headquarters and Supply Company consisted of one First Lieutentant and 20 enlisted men. The 21st AA Battery consisted of a Captain and a First Lieutentant with 79 enlisted men. The 22nd AA Battery consisted of a First and Second Lieutentant with 67 enlisted men. The 23rd AA Battery consisted of a Captain and 75 enlisted men. The 24th AA Battery was made up of a Captain and a First and Second Lieutentant, with 75 enlisted men. The 25th AA Battery consisted of two Second Lieutentants and 71 enlisted men. The Medical Detachment consisted of one First Lieutentant and nine enlisted men from the Medical Corps. And the Ordnance Detachment was made up of ten enlisted men of the Ordnance Corps. AMERICA entered the war with little or no knowledge of the science of anti-aircraft gunnery. However, profiting by her years of the war, France had evolved all sort of formulas, methods of fire, fire-control; and all sorts of machinery and guns, for the purpose of winging the audacious Hun fliers. Our first step in this direction, therefore, was to send our officers to the French for instruction. The first adventurers in this field were twenty-seven officers of the Coast Artillery Corps. As one of them put it, this assignment was a big surprise to them. Who, in his wildest dreams, before this war, would imagine that the Coast Artillery would shoot at aeroplanes? Now, after the war, who meeting the returning anti-aircraft sectors and batteries, and looking over their records, can doubt but that they did learn: their toll of German machines is quite respectable. Two of our first anti-aircraft officers sent over relate as follows: As a grand finale to the first training camp at Fort Monroe, a call was sent for two hundred lieutenants for immediate service in France. When the smoke cleared away, we found ourselves in New York knowing that we were going to France, and that was all we did know. Twenty-five of us embarked September 7, 1917, as casuals on the ships Pocahontas (the old German liner Princess Irene) and Tenedores. We had not the slightest idea whether we were to man railroad guns, trench mortars, or field guns, but had never heard of anti-aircraft guns as belonging to the C. A. C. However, the C. A. C. soon acquired them. The order came, at the time we landed at St. Nazaire, that twenty-five of the most technically trained officers arriving, were to be sent to study anti-aircraft at the French School. There were exactly twenty-five C. A. C. officers on the two ships, and we were all instantly elected and sent to Arnouville. We arrived there on the 25th of September, after having braved the terrors of a French train and Paris, and were met by Captains Glenn P. Anderson and G. F. Humbert in charge, who escorted us to a chateau and told us that this would be our home for the time being; that we were all technical men, and that we would soon be shooting aeroplanes. Life at the chateau was filled with many adventures. Our first discovery was that although the French architect who was responsible for erecting the place had a keen eye for beauty, he had no knowledge or common sense about sanitation. Our army experts, consisting of two men from the engineer corps, however, soon remedied that, though we had to resort to camp methods for some time. The photo on the left is of the Chateau d' Arnouville, the training camp of the American Anti-Aircraft Gunnery which is 30 minutes from Paris. Classes were promptly started, under the tutelage of Captain Gassier of the French Army, Captain Rollet, a Frenchman with a biff shagffy beard, was the advisory board, while Captains Anderson and Humbert looked after the administration and were busy translating and preparing mimeographs. They had been at the chateau for some time before we arrived, but although they had been working mightily, at the time, they had but a few mimeographs prepared for us, so we got most of our dope from our French instructor. The first week we spent in a bewildered haze, trying to get what it was all about, for Captain Gassier's English was at times quaint, and the blackboard was not big enough to hold all of one of the equations that were so simple to him. Besides, the blackboard was usually carefully camouflaged by his back, while he was writing down equations and erasing them. There were four of us who were not technically trained men, but lawyers or merchants by profession, and I wish to say here that those men certainly did some wonderful work. They spent all their spare time studying mathematics and some even slept with a trigonometry book under their pillows. After six weeks of study, during which time, it was necessary for us to go to Paris every week to get a bath, due to the aforementioned oversight of the architect we were sent out for some practical experience. Our class was scattered over the French front from Verdun to Luneville for an observation tour of two weeks. As three of the officers approached Nancy, enroute, that town was undergoing a big air raid. The train was stopped outside, and the officers climbed out and got their first good look at this war. They watched the French A. A. 's pepper away at the audacious Germans, saw planes drop bombs and were much impressed with the good work of the French in repelling the raid. The thing that impressed us most forcibly during our trip was the important part the weather played. On cloudy days the Frenchmen never thought of going to the battery positions, breakfast was brought around to us before we got up. On clear days, however, it was different story. All along the line we were treated royally by the French officers. We were taken down into their dug-outs and served the choicest food and champagne, even in the advance positions within easy reach of the German shells. We were the first Americans to make an appearance in this sector, and so were quite a curiosity. As we passed along a trench, the poilus would whisper to each other, point at us, and stare. All along the line the whisper ran, "Les Anrericains, les Americains." After studying at Langres until January, all but five returned to Arnouville. These five went to the British school at Steenwark, along the Belgian frontier, and went up with British batteries. After this, some of us were kept at Arnouville as instructors for the arriving officers while others trained American batteries. By this time, our two regular officers, Captains Anderson and Humbert, had their mimeographs and courses all prepared, and the first course under Americans began. At first we had had to take everything on faith from the French, but as time went on, we began to see the reasons for it all, and to improve on the French methods and materiel. The prime necessity for an anti-aircraft battery is a good cook who is also a weather prophet. It was when we got to the front in April with the 1st Anti-Aircraft Battalion that this was brought to light. If the day promised to be fine, the cook would have the battery fed and on its way by 3 a. m. If it was to be a bad day, breakfast came late in the forenoon, while we ground out some much needed rest. Beautiful days and bright moonlight nights, such as lovers rave about were our worst times. The Germans operated then at all times, and had an especially nasty habit of slipping over at 3 or 4 a. m. and returning to their homes again before it was broad daylight. Clear weather, fine for flying, meant 24 hours of vigil per day for the A. A,'s even though they fire only a hundred rounds all day. In May five of us were sent back to America, and thereafter three men were sent each month, to train batteries and to instruct in the anti-aircraft course at the Coast Artillery School at Fort Monroe. Lt. Stapelton C. Detrick, Jr., Lt. J. M. Lewis, Lt. Wynne, Lt. W. S. Barker, Lt. R. C. Edwards, Lt. Miller, Lt. Jenkins, Lt. Heskets, Lt. Ewell, (died on a transport going back to France, in October, pneumonia), Lt. Edward R. Holland, Jr.
Lt. Benjamin P.Harmon, Lt. C. W. Lawrence, Lt. Mitchell, Lt. Taylor, Lt. Ralph E. Glasheen, Lt. A. C. Dixon, Lt. H. K. Webb, Lt. S. Shilling, Lt. A. F. Hull, Lt. D. S. Ward, Lt. Williard V. Brenizer, Lt. J. H. Cochran, Lt. William R. Tower. Lt. A. W. Chapman, Lt. H. N. Marsh, Capt. Humbert, Capt. Rollet, French Army, Capt. Gassier, French Army, Capt. Anderson. Arthur Horbert Whitney was born 29 Mar 1897, Northfield, VT, the second child, first son, of Arthur H. and Mamie E. (Ivey) Whitney. Two more children came after him. In 1904, Arthur, Sr. died. Mamie brought her four children back to Williamsburg, KS, where she was born, to live with her parents on their farm. In July of 1908, her mother died, and in December of that year, Mamie remarried to David Wright. In the 1910, Williamsburg, Franklin Co., KS Census, Mamie was living with Mr. Wright, an innkeeper, (she is listed as "washer woman") along with her oldest daughter and her youngest son. The second daughter was living with Mamie's sister. The oldest son, Arthur, Jr. age 13, was living with Mamie's brother, Orey Ivey, his wife and son, my father, age 11. In 1913, Mamie married again, a miner named William T. Taylor. (We don't know what happened to the second husband.) Mr. And Mrs. Taylor may have gone to Arkansas for a while, and maybe Arthur went with them, because on his tombstone at Ft. Logan, CO, cemetery reads "Arkansas, 24 AA Btry CAC, Mar 29, 1897-June 27, 1966". By 1914, the oldest daughter is married living in Iowa. The second daughter, Marion, went that year to Montana with Mamie's sister. Marion married Harold Wells, a homesteader there in June 1918, he went into the army shortly after the marriage and was sent to France, where he met Arthur Whitney. My father graduated from Williamsburg, KS, High School that year. My grandfather, Orey Ivey died in Oct 1919. In 1920, my dad and grandmother were living in an apartment in Ottawa, Kansas, he was attending college at Ottawa University. Mamie is living with the 3rd husband and her youngest son in Williamsburg, KS. Mamie died in 1922, and her youngest son went to WY to live with his sister, Marion Wells, who had moved there from Montana. How are you these days. Fine I hope. I am as well as can be expected. How is the weather out there these days, I suppose that it has started to snow. We have had a few frosts but no snows. Say in your letters you ask me if I had any pictures, I haven't any at present, but might have some taken some of these days. But that doesn't stop you from sending some of your self and old man. What did you(r) old man do before he enlisted. I don't suppose that it is any of my business, but I would kindly like to know. Well it is raining today so we got off and that is what we like the best of course we have had lots of other days off. We sure have (f)ine homes here nice beds and good eats. We went out and found a piano today so we have a real ideal home now So if the Germans don't bother us we are setting pretty. Well I will ring off for this time hoping to hear from you soon. Bat C 1st A. A. B. According to Mary Kramer on April 15, 1919, her father received a card from Arthur saying he would land in America at San Francisco. This card must have been delayed in the mail, because Arthur had already been separated from service at Ft. D. A. Russel Wyoming on 3/18/1919. Her father tried many times over the years to find out what happened to Arthur, writing letters to the Army, etc. He did find out that Arthur had been shipped back to America, but he didn't know where or when, as far as they knew. Arthur's sister Marion Wells and her daughter, Rose Zella Wells Proctor also wrote letters to the VA looking for him, without success. It was a huge loss for both families. Mary Kramer found Arthur's Social Security Application which gave some clues to where Arthur went after the war. Arthur Horbert Whitney living at 2316 West Monroe St., Chicago, IL. There was no name of the employer listed but the address was at 2024 So. Racine Ave., Chicago, IL. The Social Security Application listed his age at 39, with date of birth as March 29, 1897, in Northfield, Vermont. His father was Arthur Horbert Whitney and his mothers name was Mamie E. Ivey. Date signed: Nov 27, 1936. On the SSDI website, Mary Kramer found that his last benefit went to Pueblo, CO, where his friend Dr. Woznik lived. "WHITNEY Arthur H. Whitney, 3767 Osceola. Good friend of Dr. E. S. Woznik, Pueblo,, Dr. and Mrs. Daniel S. Montoya, Denver. Services 9 a.m. Thursday, TREVINO CHAPEL OF ROSES. Military honors Ft. Logan." From his obituary, Mary Kramer found out that Woznik was a dentist for 50 years in Pueblo and was a year older than Arthur. Possibly Dr. Woznik might have been in the same Army unit, or some how met Arthur during the War. Dr. Montoya was a chiropractor, according to the city directories, and his office was only a block or 2 from Arthur's Denver address. 2nd Lt. Thomas G. Chamberlaim, Battery D, 1st AA Bn, C.A.C. Walter Barber contacted me about a letter he had found 29 years ago. It is a wonderful articulate letter to his sister Frieda and the prose is typical of a very well educated man from Yale. The 8 page letter was hand written on American YMCA Letterhead and Walter faxed me a copy of it. The envelope was addressed to Mrs. T. L. Chamberlaim in Auburn, California. I have transcribed it here for all to read. Generally my letters are written to the whole family. With activity day and night it is difficult to write to each one. You know why I don't write more often but this time I'm trying to say "Hello" all around. To begin with the topic, which comes first of all over here - you know by now of the allied advance on the Soissions, Chateau-Thierry, Rheims Salient. This was a very important victory. Not only were the Germans once more hurled back across the historic Marne with terrific losses; but the most direct route to Paris has been definitely barred. The fighting qualities of the American soldier have been established beyond peradventure of a doubt and the far heralded Hindenburg offensive (now with the Crown Prince in command) is fast drawing to the dismal failure to which it is doomed. For a long time we have been hearing of the great spring drive. But now America is pouring in troops, which will soon mean numerical superiority, and General Foch will have a great reserve army to rely on. This was the Kaiser's year. The allied year is coming whether it is next year or the one after depends on America; but when it comes! -the war will soon be over and the Kaiser's "Place in the sun" won't amount to much. The man who knows most about this war is the one who goes out over the top with rifle and bayonet. He fights, the rest of us back here listen to the noise, and at times make considerable noise ourselves. We may know what it shells are and what gas is-but we don't know the clash of steel against steel. I have had the opportunity of talking to many officers and men going into the line and coming out. They have many thrilling tales to tell, especially those coming out and they have an unlimited assortment of proof to. There are German guns and rifles and pistols, and bayonets and field glasses and gas masks, and packs and pictures and Iron Crosses and watches and metals and coins and each has its own exciting story. One group tells of a big feed they had in a German officers dugout. Another tells of an English speaking German prisoner who said, "The French are fighting for their country and the Americans are fighting for souvenirs." There are Germans who don't know that America is in the war; and others who know now She is in, without knowing why; but a more important factor, for the time being (known to all Boche who have met the Yank on the field of battle) is that the American soldier is a fighter to beware of. The other day I saw Paul Peabody. Perhaps you remember him. He was in the 1915 class at college. He is in the regular army and is now a captain. Quite often we invite an Infantry officer in for a meal. Crude as our surroundings are-they seem like an oasis in the desert, to a man who has spent several days in " no man's land" with open warfare waging. A fine fellow was in for a meal the other day. He was a member of the 1915 class at Yale. He had been wounded on the cheek but he didn't stop-and was anxious to get back into the fray. Another long rangy Lieutenant talked in a very interesting way about the exploits of his platoon. He was about to leave when I noticed a ring on his finger. The ring bore the Stars and Crescent. He proved to be a Kappa Sigma from Tennessee. There was another Lieutenant who sat with me the night before he went "Over the top." A fine big burly chap. I told a mother about him in one of my former letters. He told me he would see me when he came back. Well-I shall never see him again. This is a great big war in a great big coladas and those who have the chance to pay the price are fortunate. There can never be a satisfactory peace without the overwhelming defeat of Germany.